While Demondrae Thurman is one of the leading euphonium soloists of our day, he is also an accomplished chamber musician, conductor, trombonist, composer and educator. The high level of his work is evident, as are his passion for music and people. 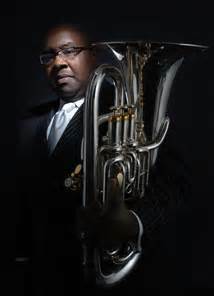 “The Fourth Valve” tm is delighted to host Demondrae Thurman as our first euphonium playing respondant. Enjoy! 1. How do you conceive of, describe or imagine the ideal euphonium sound? The fact that the euphonium is a conical instrument means that it should be a wide, rich sound. That is sort of the basic or fundamental way that I think about the euphonium. The sound should be wide, meaning that it comes at you from all angles, and very rich. Secondarily, you have to think about vibrato as a primary component of the euphonium sound, because without it, you are not really making a characteristic euphonium sound. It seems as though you change timbres sometimes as you play solos. Are there any particular instruments or colors that you try to emulate as an expressive device? I guess I do not really think about them consciously, but I know that I borrow playing concepts from the saxophone, from the flute and probably mostly from the human voice. Those are my primary ones; I would place tenor trombone fourth on that list. 2. How did you develop the emphasis you have on musical expression? Sometimes, it is something that people do not think about very much. That’s true. I am a pretty big student of music in the sense that I like to know how it’s constructed. My beginning point in studying a piece of music is trying to analyze the form. I think the form, (just look at the root of the word), it really informs how you can interpret the music. You start with the large scale things, big sections, breaks and things like that and then I try to identify what each major section of the piece of music is trying to say. My expressive gestures and my expressive elements such as vibrato, tempos and articulations all start to make sense once I have decided what the major section wants to be. Once I have that figured out, I break it down to a smaller components: how does this phrase lead into this phrase and how do I make the transitional material fit with the mainstay melodic or motivic material? Those things inform my choices as well, but I think that you start with a pretty detailed analysis of the formal structure, not so much a detailed harmonic structure but try to get a sense about what sort of harmony and what sort of rhythmic elements I need to address and let that guide my interpretation. It sounds like an architectural approach first. It very much is. Take a look at what you have, the space available to you, and build within those parameters as opposed to trying to make something different than what is there. 3. Please name two different ways you find inspiration to play music. For my musical inspirations I really draw on the music and lives of Gustav Mahler and Dimitri Shostakovich. Those are the two composers that I identify with as people and as artists. A lot of times you can dig somebody’s music, but you may feel that you can’t identify with the type of person they may have been, or even are, (for modern composers). Say with Mahler, I can go back and listen to the third Symphony and re-focus. Similarly, I can go and listen to Shostakovich 10th and sort of re-focus musically which is nice. When I feel like I need a refresher to cleanse my ears, I listen to Bach. I really feel like his harmonic sense is the thing that got me started enjoying music at a really high level-where it became more than something that I was just studying and became a passion. I go back to Bach for that. For non-musical inspiration, I have always been a fairly spiritual guy. I won’t say religious, but spiritual. I sort of dig deep inwardly to come up with many things, and and that makes me look towards my family for inspiration. I think about my grandmother, who has passed away, and for a long time I carried a picture of her in my performance folder. I think about my children. Those are the two sources of non-musical inspiration that kept me going. 4. What was your typical warm-up routine like when you were in college, and what is it like now? I really didn’t warm-up in college. I didn’t at all. I would sort of noodle a little bit and play through a Rochut or a movement of a Bach unaccompanied cello suite. Then I would start to practice. It wasn’t really organized at all. Whereas now, it is very structured. I do three to five sets (that’s how I think about it, as actual sets like weightlifting), of long tones; three to six sets of lip slurs, and then I do some type of scale oriented thing-whether it is scales in thirds or arpeggiation type patterns. Last;y, I play some kind of song during the session. It takes about thirteen minutes. 5. You have an interesting combination of skills. You are not only a conductor, but you have conducted orchestras, which is somewhat unusual for a low brass player in general, but particularly for euphonium players. How has conducting, particularly conducting strings, informed your euphonium playing? And why choose orchestra? I’ll start on the second part of the question first. I’ve conducted both band and orchestra and I still conduct both. I’m the wind ensemble condtuctor at Samford, and I am the assistant resident conductor for the Tuscaloosa Symphony. I also freelance in both wind band and orchestra, so I’m still doing both as a conductor and a player. My start was with wind band, and I conducted that band for eight years at Alabama state. When I got to Alabama, an opportunity came up to conduct the university orchestra and I took it. The reason I’m infatuated with the orchestra, maybe more so than band, is the repertoire. I love to be able to spend time working through the true masterpieces in classical music. I’ve mentioned a couple pieces already, but I’ve had the good fortune to conduct Brahms and Beethoven symphonies, works by Sibelius and a whole bunch of other things that I grew up studying and ended up falling in love with. It has nothing to do with the fact that I play the euphonium or any other instrument. I think that it is beautiful music and I want to touch it, to deal with it, and to study it. 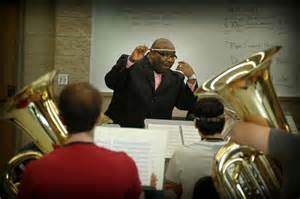 5.How does conducting a string orchestra inform your euphonium playing? I was informed on string playing before conducting the orchestra. I have the good fortune of being married to an absolutely fantastic violinist. She studied at Northwestern University, played in the New World Symphony, and the Chicago Civic Orchestra. She is the concert master for most of the regional orchestras in and around Alabama, and I’ve seen her practicing for the last thirteen years. The musical idea that I most often take from her is how she uses the bow and distributes it to get the best musical product. She’ll show me a phrase where she needs to take two or three bow strokes and there is only one phrase mark over the line, and I transfer that to breathing. As brass players, and I’m not really sure why, we treat phrase markings almost religiously. By listening to her, I began to start thinking outside the box; not just playing what is written on the paper, but understanding how to present the composer’s best intent. It’s been really cool to listen to her do that without even thinking about it, while I have a hard time and feel like I am breaking some kind of law by taking a breath in places that it “looks like” I shouldn’t. That’s been really important for me. That’s the thing I’ve taken from her, that the player only has so much bow, so if a composer didn’t take that into account then it is her job to try to figure out what they had in mind. And so, I say, do the same thing with air. 7. One of my passions had been to remedy the situation that bass trombonists and euphonium players are consistently get left out of the chamber music experience. It is nearly impossible for them to have a meaningful musical experience without a conductor in school ensembles, with the exception of a tuba quartet for euphonium or as a bass trombone substitute for tuba in a brass quintet. Do you have any thoughts on giving greater chamber music opportunities to euphonium players, and if you could kind of reflect on the chamber music opportunities that you had as opposed to friends who played trumpet or trombone? I came into the experience early on. I played both trombone and tuba a in brass quintet in high school and my first couple of years in college. When I started to really focus on euphonium, I formed a series of tuba/euphonium quartets at The University of Alabama and began to participate in what has become sort of the ITEC series-competing and winning with a tuba euphonium quartet. Out of that came Sotto Voce Quartet, the band I play in now. We have taken it pretty serioulsy, as you know, have produced four recordings and have traveled the world. That is one of the ways we have addressed this issue. 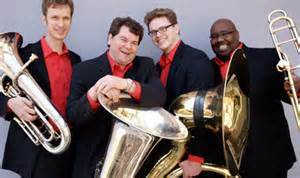 We approach the medium of the tuba euphonium quartet by taking it as seriously as a woodwind quintet or whatever chamber music ensemble you might imagine. The other way to do it is to have it created. One of the unique things about euphonium for sure, and I would even put bass trombone in that, is that composers are starting to think about our instruments as solo and chamber music possibilities, especially in the last fifty to sixty years. Take advantage of those people and have them create a chamber music group. For example, on my last cd I had a piece commissioned for oboe, euphonium and piano. This is a trio that is in some ways no different than the Poulenc Trio for bassoon oboe and piano. To find great music like that and have it taken seriously is what I am trying to do. Consider including an instrument like the piano or violin not only to legitimize the piece of of music (at least in the eyes and ears of sort of “lay” classical musicians and listeners), but also to participate in classical music in the way you have imagined. 8. I think that the euphonium and the bass trombone have an advantage in this one respect, they are both comfortable to accompany and to serve as a soloist in a chamber setting. Like the cello, they can blend with anybody, but they can also be a prominent solo voice, which I think is a challenge for some instruments like perhaps the tuba or string bass in a mixed chamber music setting. Right, and a lot of that, too, depends on who is playing it. You could put tuba back in that mix, depending on the player, and which instrument they choose to play-a smaller lighter horn or one of the bigger horns. It depends on those types of things. Perception is also important. What is blending? Some could say the euphonium doesn’t blend at all, and yet it does-the perception is just not out there. For example, regarding the piece for oboe piano and euphonium both the composer and the oboist felt that we would have trouble discerning the oboe. My opinion was that the oboe would be the most present instrument of the three, just because of the nature of the other instruments. Once we began rehearsals, they both commented that I was right, and the composer said that he could have written anything for euphonium he had wanted. The oboe is loud, so of course it wouldn’t have been a problem. When it’s time for me to play an accompanimental role I can ease myself into the bottom of the piano sound, and when it is time for me to play solo, as you mentioned earlier, I can change my tone color and achieve that as well. It was amazing to watch the composer come to the realization that, “Wow, I didn’t believe that this could be this good of a piece when I wrote it because I didn’t realize what the euphonium contribution could be. I thought about that first question for quite a while when you sent it to me. I am not one to necessarily grade performers or performances, but the euphonium performance that left the biggest impression on me was hearing Steven Mead play the Ellerby Concerto at the 1998 International Tuba and Euphonium Association Conference that was held at the University of Minnesota. I think it was a combination of things. First, I absolutely love the piece! It is one of my two or three favorite things to hear on euphonium and I knew that it would be the moment I first heard it. Secondly, Steven Mead was fantastic. I felt as though he was playing at the top of his game at the time. He turned in an unbelievable performance. At the time, I had just finished my Masters Degree with John Stevens. I didn’t have a job, and I didn’t want to go to school. After that performance I was s left with “Wow, I certainly don’y sound like that yet, and I don’t have a job yet, so-am I doing the right thing?” It caused me to rethink what I was doing. I asked myself if I were really doing everything that I could to be great and to be viewed as one of the top players. I remember thinking to myself, “could I ever play this piece?”, which was easily the finest 20 minutes of euphonium playing I had ever heard. It didn’t make me change anything, per se, but it really made me rethink what I was doing and served as a reality check for me; Steven Mead’s performance served a great purpose. That is a performance I will always remember, because it came at such a great time for me, and I have given him credit with keeping me honest with that performance. 10. What is the best euphonium playing you have ever done? The best playing I’ve ever done, I don’t know, I’m not sure that I’ve really played great yet. Certainly my performances with Sotto Voce always give me great feeling of accomplishment. The music we play is almost all self -generated; we play about 90% of our own stuff or pieces written with us in mind. Our concerts are always really well received, and I love the guys I play with. Those concerts are always fabulous. This last year, I played several concerts in Japan. There was just an honesty and genuine appreciation of music from the people in the audiences, and I felt it raised my game to the next level. I didn’t feel like there was anybody out there who wouldn’t have given their right arm to be there listening to me play, and it causes you to play at a higher level to know that these people were there to hear you play well. They showed their appreciation with gifts and all sorts of things, so that was a great experience. I am not sure if I played great, but it sure felt like I did. 11. As far as people who are full-time, tenured professors and euphonium players, is that a small club? A lot of those people are teaching academic classes, and low brass is just a portion of their duties, as opposed to being the meat and potatoes of the job. They all do something else as well. Interested in more “The Fourth Valve” tm Interviews? Images courtesy of Demondrae Thurman, Sotto Voce Quartet and the University of Alabama. Some transcription assistance provided by Armando Alicandu.